The River Slaney flows from Lugnaquilla Mountain west and then 73 miles south through: Baltinglass, Rathvilly, Tullow, Bunclody, Enniscorthy and finally Wexford to the Irish Sea. The Slaney is primarily spring salmon fishery with the bulk of salmon angling activity taking place in the months of March to May, augmented by a smaller run of grilse in the summer months. The Slaney gets a run of sea-trout and the best fishing takes place from the end of June to the end of August. The best flies to use are: black pennell, teal, blue and silver, peter ross and night time fishing and standard sea-trout patterns produce the best results for sea trout. The Slaney gets hatches of olives, sedges and gnats. Fishing is by fly only. 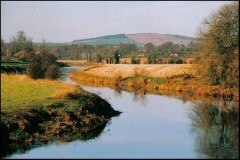 The Slaney River holds good stocks of brown trout to 8ozs and trout to 1lb are not uncommon. The River Slaney is a wide strong flowing river punctuated with slower flowing areas and pools in some stretches. The river between Enniscorthy and Bunclody is wide and fast flowing. From Bunclody to Tullow the banks are generally clear and the river is wide, with a strong fast current. However, there are a good number of weirs punctuated by pools with some slower flowing areas. The stretch from Tullow to Baltinglass is fast flowing, rocky and overgrown in parts. Fishing on the Slaney above Enniscorthy is managed and controlled by a variety of angling associations and riparian owners. Further details are provided on our ‘Angling Clubs & Permits’ page. Fishing below Enniscorthy is generally free. Given the current regulations, a number of fisheries are closed.